Great job on landing that big Hoffmeyer account, Jim. That will really help us with the quarterly report. Gee thanks Mr. Petersen! Speaking of my job, have you had a chance to think about that raise I asked you about last month? Now Jim, you know how it is. If I caved in to every salesman who asked me for a raise, we'd never make our numbers. Sorry Jim, I've got a two o'clock foursome at the country club! How often has this happened to you? 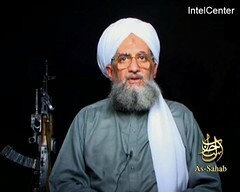 Hi, I'm Dr. Ayman al-Zawahiri of Qaedant Seminars. Jim may have landed that big account, but he sure needs to learn a thing or two about negotiating with his boss. That's why we've designed an exclusive new two day strategy course to teach busy professionals like you how to negotiate your way to the top... Qaedant style! But I've tried other negotiation courses before. What makes this so different? Unlike the competition, Qaedant's patented SubmissionPower system has over 1200 years of proven worldwide success, from Palestine to Andalusia to Washington, DC. Our patented training course doesn't just tell you what to say -- it shows you how to back it up with the high-impact credible threats that will give you the upper hand in any negotiation. Within days you'll be putting SubmissionPower to work everywhere! Get that big raise and promotion you deserve! Stop those harrassing bill collectors! Get into the college of your choice... on a full ride scholarship! Put an end to offensive cartoons and opinions! Make that pesky neighbor flee for his life! Let Qaedant's expert training staff show you how to harness the secret power of "the 3 V's" -- virulence, victimhood and violence. You'll be amazed at the results! Sounds great, but how do I know this will work? "I got tired of my wife's constant nagging and whore clothes. Now she won't leave the house unless she's covered in a black tarp -- with my permission! Thanks, Qaedant Seminars!" "Last year the local college museum housed pictures that offended my religion. Today it's the home of the Lutheran Studies department. And all I had to do was behead a few art majors! Two thumbs way up!" "After using SubmissionPower a few times, I really didn't even have to negotiate anymore. Now people do exactly what I want, and I don't even have to ask. It's like magic!" Okay, okay! You've made a believer out of me. Where do I sign up? Saturday and Sunday May 1st and 2nd at Townville Ramadi Inn and Conference Center, I-73 and Jefferson Avenue. Kneeling spaces are limited so register before midnight tonight, online or by phone at 1-855-SUBMIT. $395 per person by check, M/C or Visa. Ask about group discounts! No Jews, polytheists or women please. Let's check back with Jim and see how he's putting SubmissionPower to work. 200% and a corner office? For God's sake, please, I have children. It is a start, infidel. But I will be back! Now that's what I call the art of the deal!